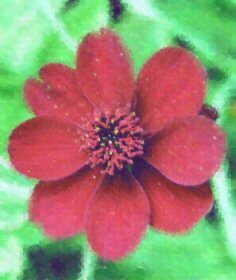 The chocolate cosmos (cosmos atrosanguineus) is one of those few plants that gets even non-gardeners excited. Firstly, as the name implies there is something distinctly chocolately about this plant. No, its not just the colour of the flowers, although they are a wonderfully deep and dark rich brown to purple. It is the scent which is unmistakeably chocolate. Adults and children alike love to smell the flowers which give off a rich and delicious smell throughout the summer. Next, we find that wildlife loves the chocolate cosmos too. Bees in particular are drawn to the flower in droves and if you are really lucky, you will find them sleeping in the flowers overnight. Take a look early in the morning and be enchanted by the sight of 2 or three young bees snuggled up around the stamen. The gardener loves the hardiness of the chocolate cosmos, a relative of the dahlia, which was first discovered in Central America in the Victorian era. Add to that the fact that it is easy to grow and requires little effort to keep it in tip top condition. All in all, for very good reason, the chocolate cosmos is one of the faviourites in the garden.